Best Outdoor Bar in Milwaukee Area: Drinks All Around! At the best outdoor bar in Milwaukee area, the Umbrella Bar has an incredible selection of wines, tap beers and specialty drinks that'll make your head spin (literally). Spicy Bloody Marys, refreshing Summer Shandy, a dry Cabernet Sauvignnon, a smooth Pinot Noir... Is your mouth watering yet? 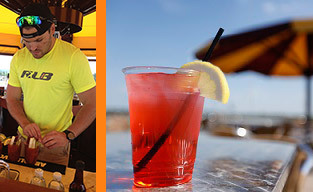 Pair amazing drinks with an incredible view of the live entertainment going on at The Rock Sports Complex. Mix in fresh air, great company, and you've got yourself one hell of a good time! Whether you're want to kick back and relax with a nice cold one on a hot summer day, play a game (or two) of bag toss, or live it up for ladies night, our sports bar in Franklin (with outdoor seating and plenty of it!) has you covered (you're covered by an umbrella, get it?). Contact the best bar in Franklin, WI for more info on our drink menu and upcoming specials.